Trekkies rejoice! 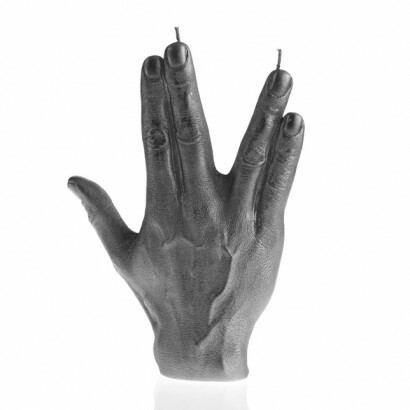 The iconic Vulcan salute has been formed in wax to make a large and impressive candle that encourages you to "live long and prosper". The Vulcan salute was made famous by Star Trek's Mr Spock played by Leonard Nimoy who devised the greeting, making this a logical gift choice for Star Trek fans. With a thirty hour burn time, should you wish to burn this steel coloured double wicked candle, there's more than enough life for multiple uses, but it also makes an impressive decoration with peaceful vibes.